Dr. Hansen is an experienced and committed chiropractor in the Elk Grove/Laguna Area. Born and raised in Elk Grove, Dr. Hansen’s ties to the region are multi-generational. In Fact, Dr. Hansen’s grandparents raised 8 children here, and Eisenbeisz Street is named after his mother’s family. While growing up, Dr. Hansen witnessed many family members suffer from various medical ailments. Both grandfathers suffered strokes in their early 50’s, two aunts, an uncle, and his father all developed rheumatoid arthritis at a young age, and his mother suffered from headaches, anxiety, and neck, shoulder, and chest pain. Dr. Hansen saw doctors prescribe his father treatment after treatment of available and experimental medicines, and he saw a variety of moderate to severe side effects that resulted. He saw his mother get prescribed trigger point injections to alleviate her pain, and he saw the failure that followed. At one point, doctor error during an injection resulted in a collapsed lung, two week hospitalization, and near death. Dissatisfied with treatments received by his family, Dr. Hansen chose to pursue a career in medicine so he would be able to learn what it took to be healthy and to help others. So, he enrolled in pre-med at San Joaquin Delta College and then Sacramento State University. While attending Sacramento State University, Dr. Hansen sustained a severe lower back injury. After seeing the campus physician, he was prescribes pills and rest. When two weeks had passed and the pain had not subsided, the campus doctor referred him to a physical therapist. Still, his paid remained constant. It was at this point that Dr. Hansen’s father introduced him to the discipline of chiropractic. Following the very first adjustment, he noticed incredible improvement. After a couple of months of chiropractic care, he was fully recovered. 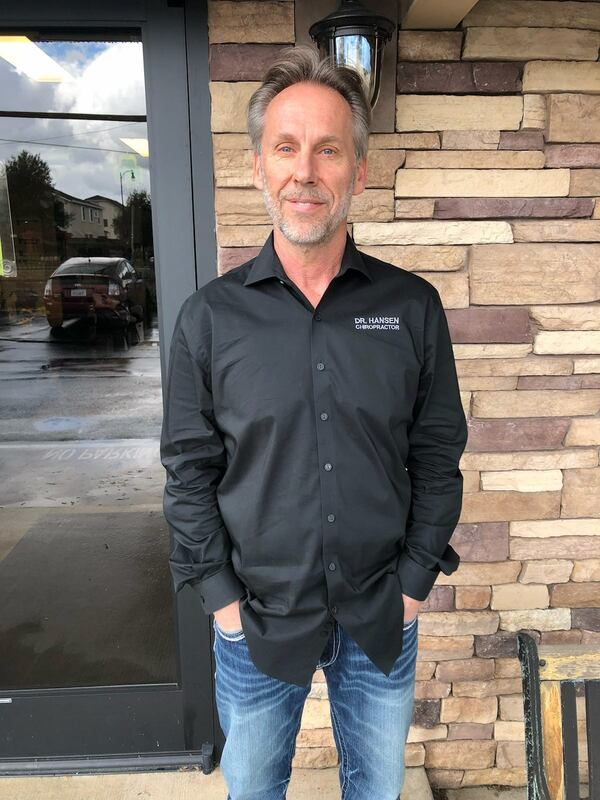 Dr. Hansen returned to Sacramento State University, took a few more courses in chemistry and physics, and then enrolled at Life Chiropractic College West. Four academic years later, Dr. Hansen graduated as valedictorian of his class. After 20 years in practice I thought I had it all figured out. I had a very successful practice and many loyal patients. Then, I was involved in an auto accident. I was hit from behind and suffered from whiplash. Initially I thought, “No big deal, I will just get adjusted and heal up.” That wasn’t the case. I had two herniated disks, one torn disk, and pinched nerves in my neck. I suffered general back pain and arm numbness that greatly weakened and withered my right biceps muscle. I visited a dozen chiropractors practicing a variety of chiropractic techniques, but remained in pain after two years. I was in such pain that I considered retiring. Making matters worse, I encountered professional challenges, too. The first was a close family relative that I had treated for over 20 years. Although, I had previously been able to treat a neck injury and resulting epilepsy, his problem returned and I was now unable to get him stabilized. Second, I endured the passing of a long-term patient who had developed throat cancer. Finally, there were several other patients whose lack of healing and frequent flare-ups began to frustrate me. I was in pain and my skills were no longer as effective as they had previously been. I searched the internet, called up old friends, and went to seminars looking for answers. My answer came at a re-licensure seminar in Las Vegas. A Doctor was giving this very awkward looking adjustment in the reception area with about 20 people standing in line. So, I stood in line and received my first Bio Cranial adjustment. After several sessions, “it” happened. I was finally free of neck pain and arm numbness. Even better, I had no more headaches! As a surprising bonus, my wife and I felt less stressed out. We were just happier! Bio Cranial became another tool that I use to treat my patients. Relief of pain and improved sensation would be a recurring theme reported by dozens of patients. This is because Bio cranial releases torqueing on the brain and spinal cord, thereby reducing strain on the entire nervous system. What results is that the entire body and mind functions better. After hundreds of hours of research, everything came together. We offer 20 years of chiropractic experience, as well as a variety of additional services. My overall goal is to help you achieve health and happiness, and I offer a weekly email newsletter that covers various topics related to achieving and maintaining Living Health. I am relentless in my quest to stay on the cutting edge and provide outstanding healthcare. I truly enjoy caring for people, and I don’t want to waste my given potential. So please, spread the word such that I may help more people! Dr. Hansen has been practicing chiropractic since 1986 and now has one of the largest solo practices in California. If you are looking for a committed, passionate, and caring doctor of chiropractic to help heal you, then look no further. Call today to join the thousands of enthusiastically satisfied patients that Dr. Hansen has helped!